eyeSight Technologies, the leading computer vision company which brings edge-based Computer Vision and AI solutions to IoT devices, has today announced that it has collaborated with NTT DOCOMO, INC., Japan's leading mobile operator with over 76 million subscriptions in Japan. The collaboration brings eyeSight's market-leading sensing capabilities to NTT DOCOMO's dtabTM Compact d-02K tablet, augmenting the existing interface with natural touch-free interaction capabilities. eyeSight's technology allows dtab Compact users to enjoy a new level of natural communication with their device in a way that is responsive to their actions. With simple hand movements, users can control different app functions with greater comfort and simplicity. eyeSight's sensing technology utilizes the existing built-in camera of the dtab Compact d-02K tablet to enrich the user experience. "It's an honor to partner with an innovative leader like NTT DOCOMO to deliver intelligent user experiences that are responsive to users and their needs" said Gideon Shmuel, eyeSight's CEO. "Our computer vision AI enables far more than touch-free interaction, it unlocks a world of personalized experiences with IoT devices and automotive systems that identify users, their actions, and predict their needs. All in a locally-processed manner that is fully private and cloud-free". 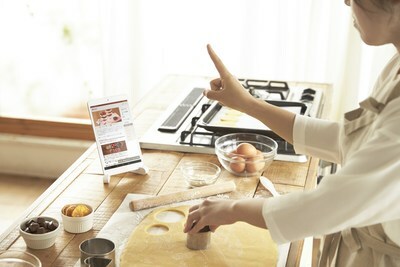 NTT DOCOMO's dtab Compact d-02K tablet features eyeSight's technology in various supported apps and is currently commercially available throughout Japan. "dtab" is a trademark of NTT DOCOMO, INC.
eyeSight is the leading provider of embedded Computer Vision and AI solutions, bringing user awareness and gesture recognition technologies to a variety of devices and industries. The company's technology improves daily life experiences in the home, the car, and with other consumer electronics using intelligent interactions that are responsive to the presence of users and their actions. With eyeSight's technology devices now "see" and "understand" their users, unlocking a world of enhanced user experiences.